What is the real history of the House of Dracula? In Raymond Rudorff’s novel, The Dracula Archives, a mysterious narrator pieces together fictional letters and journal entries which reveal all and cast a shadow of doubt over the success of Van Helsing’s mission to put an end to the evil Count Dracula. 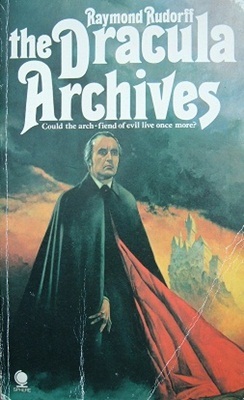 The Dracula Archives was first published in 1971 and although it is an interesting and well-written novel, it seems to have escaped the notice of many fans of vampire fiction, which is a pity because the book has much to offer. The book begins with a couple of introductory pages written by an ‘unknown hand’ who states that reading Bram Stoker’s Dracula was a life-changing experience for him (or her?). The narrator, who believes Stoker’s book to be more than a novel, points out that Stoker’s book gives only the vaguest hint of Dracula’s origins and the narrator believes that it has been preordained that he should be the one to reveal this dark and blood-stained history. The ‘unknown hand’ offers more supplementary information in the middle of the book and also at the end—where he reveals a little more about himself—but the majority of the book consists of the letters and journal entries that the narrator presents to back up his theories. The journal entry style utilised in The Dracula Archives is similar to that used in Stoker’s ground-breaking novel and this makes Rudorff’s book feel more like a companion piece to the original story than if he had presented it in a more conventional way. The story also ties in very well with the novel that inspired it because it would seem that Rudorff has researched many of the same sources Stoker used. Most notably that of Vlad the Impaler. Rudorff also draws heavily on the history of the Karnstein family. The Author Joseph Sheridan Le Fanu built his story Carmilla around the history of the Karnsteins and it is believed that Stoker drew some of his inspiration from the story as well. A mysterious horse-driven carriage with sinister occupants turns up more than once in Rudorff’s novel, as it does in Carmilla, and those readers who have seen Hammer’s movie The Vampire Lovers (1970) may cast their mind back to the opening footage and find these scenes particularly poignant. I certainly did. Rudorff has also taken inspiration from the life of Countess Bathory and, following the initial introduction, the main story begins in 1876, when a young man named Franz von Langenfels accompanies two of his friends on night-time visit to the Countess’ castle, where they find her final resting place and steal the jewellery she was interred with. In fact, Franz is so desirous of one of her rings, which refuses to be removed, he cuts off the Countess’ finger in order to attain the ring. This turns out to be a very bad move indeed. Later on in the story, the reader meets a woman whose life force is being drained from her due to some strange malady that is confusing her doctors. Still later, a young man of ferocious intelligence enters the story and develops an obsessive interest in attaining mastery over life and death. In a similar vein to Dracula, Rudorff’s story also has a young man who is in danger of losing his fiancée to a vampire, and the scenes where the jilted man is rushing to try and save his lover are highly reminiscent of the scenes in Stoker’s book where Van Helsing et al. are rushing to put an end to the Count. Like all the best stories The Dracula Archives has enough truth worked into it to make it easy for the reader to suspend disbelief. You only have to open a history book to read all about Countess Bathory’s bloody history and the same can be said for Vlad the Impaler. Ditto that for the Karnstein family, and Rudorff has blended much of the history of these blood-thirsty individuals into his tale, to create a mix of fact and fiction that should appeal to any reader who enjoyed Stoker’s novel. Unfortunately, The Dracula Archives has been out of print for quite some time and, at the time of this review, it has not been made available as an e-book. However, second-hand copies are usually available to buy online; so it should still be relatively easy to get hold of a copy of the book should you want to give it a try.